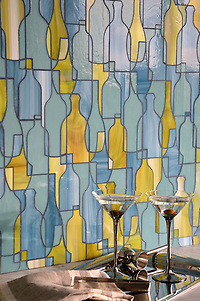 Thank you to KBCulture for featuring Bottles by Erin Adams for New Ravenna Mosaics. Connect with KBCulture on Twitter by following @KBCulture. We all wish you a very happy 2014! 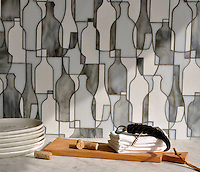 Bottles, a glass waterjet mosaic shown in Moonstone, Opal and Tourmaline, is part of the Erin Adams Collection for New Ravenna Mosaics. Bottles, a jewel glass waterjet mosaic shown in Peridot, Serpentine and Mica, is part of the Erin Adams Collection for New Ravenna Mosaics. To see more of the Erin Adams Collection, click here and don’t forget to check out what else is new at New Ravenna by clicking here.